109 Marlborough is located on the north side of Marlborough, between Clarendon and Dartmouth, with 107 Marlborough to the east and 111 Marlborough to the west. 109 Marlborough was designed by architect Charles K. Kirby and built ca. 1871, for speculative sale, one of a pair of houses (109-111 Marlborough) designed in the same style, but with 109 Marlborough faced with brick and 111 Marlborough faced with brownstone. 109 Marlborough was built first, at about the same time as 105-107 Marlborough, also designed by Charles Kirby, on land he purchased from the Commonwealth of Massachusetts on October 15, 1870. 111 Marlborough was built ca. 1872 by James Henry Standish, a carpenter and builder, who probably also was the builder of 109 Marlborough. Click here for an index to the deeds for 109 Marlborough. On February 10, 1872, 109 Marlborough was purchased from Charles Kirby by Reuben Edson Demmon. He and his wife, Sarah (Whittemore) Demmon, made it their home. They previously had lived in Somerville. Reuben Demmon was a provisions merchant and President of the Howard National Bank. Living with them were their son and daughter-in-law, Reuben Augustine Demmon and Susan Stetson (Shute) Demmon. He also was a provisions merchant and later a stockbroker. Sarah Demmon died in October of 1877. Reuben Demmon married again, in September of 1882, to Marcia Delano. 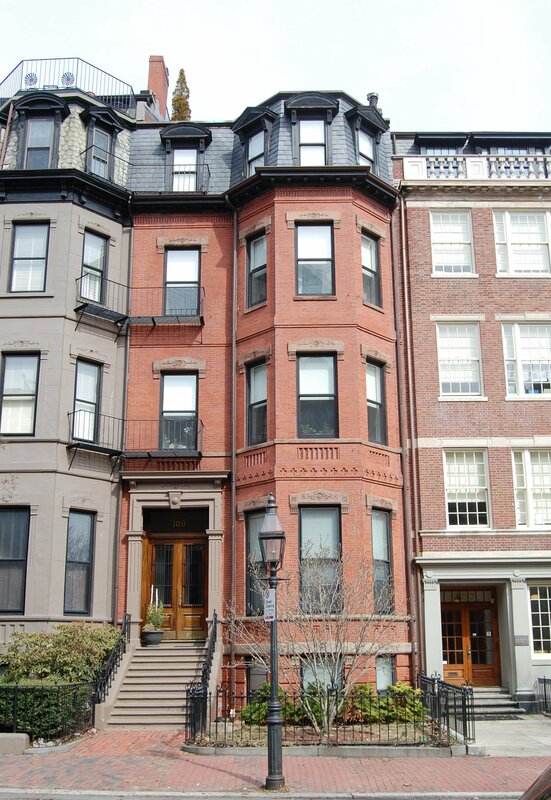 After their marriage, they lived at 109 Marlborough, and his son and daughter-in-law moved to Cambridge. Reuben Demmon died in April of 1899. Marcia Demmon continued to live at 109 Marlborough and on May 1, 1900, Reuben Demmon’s estate transferred the property into her name. By the 1905-1906 winter season, she was joined by her niece, Ruth Bradford Delano, a drama coach, daughter of Marcia Demmon’s brother and sister-in-law, Joshua Delano and Olive Bartlett (Holmes) Delano. On May 8, 1919, Marcia Demmon transferred 109 Marlborough to Ruth Delano. They both continued to live there and also maintained a home in Kingston, Massachusetts. Marcia Demmon died in December of 1936. Ruth Delano continued to live at 109 Marlborough in 1939, but moved soon thereafter. The house was shown as vacant in the 1940 Boston City Directory. On November 11, 1940, 109 Marlborough was acquired from Ruth Delano by Dallia Rocciolo. On December 23, 1940, John E. Wilson filed for (and subsequently received) permission to convert the house from a single-family dwelling into a lodging house. He lived at 114 Marlborough, where he was a janitor, and presumably filed the application on Dallia Rocciolo’s behalf. On December 26, 1941, 109 Marlborough was acquired from Dallia Rocciolo, at that time a resident of Washington DC, by Bertha Hill. By 1942, 109 Marlborough was the home of Miss Christine (Christina) Anna MacPherson, who operated it as a lodging house. She previously had lived at 400 Tremont. On February 5, 1947, she acquired 109 Marlborough from Bertha Hill. She continued to live at 109 Marlborough and operate it as a lodging house until about 1959. On December 15, 1959, 109 Marlborough was acquired from Christine MacPherson by Rose Rochelle. It continued to be a lodging house. Rose Rochelle (Goldberg) Levin Glazer Bornstein was the former wife of Reuben Levin and Max L. Glazer. She was a retired pianist and entertainer who performed as (and legally changed her name to) Rose Rochelle. She married in the early 1960s to Morris Bornstein, after which she was known as Rose Bornstein. He died or they separated by 1965. 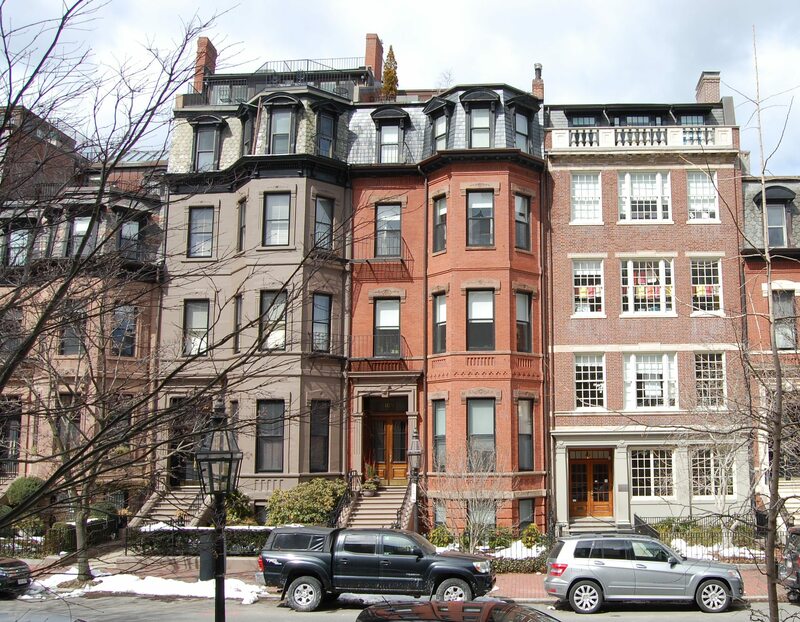 She owned and lived in an apartment house at 273 Beacon, and also owned several other apartment buildings and lodging houses in the Back Bay and South End. On November 4, 1960, she transferred 109 Marlborough to herself as trustee of the Rochelle Realty Trust. On April 16, 1962, 109 Beacon was acquired from Rose Rochelle Bornstein by Carol Elizabeth (Rolph) O’Connor Poehler Morse. She was the former wife of Thomas R. O’Connor, Percy Augustus Poehler, and Emerson Glover Morse. 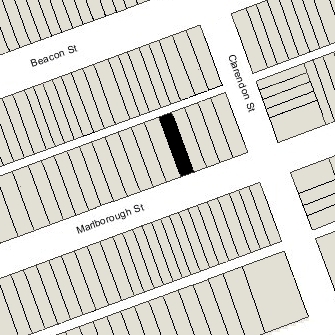 She lived and maintained her real estate office at 109 Marlborough, which also continued to be a lodging house. Carol Morse died in October of 1970. On March 3, 1972, 109 Marlborough was acquired from Carol Morse’s son, Peter Hodges Morse (born Percy Augustus Poehler, jr.), by James V. Sullivan, trustee of The Lawndale Realty Trust. The property subsequently changed hands, remaining a lodging house through the 1970s. On January 2, 1981, 109 Marlborough was purchased by Joseph Jokton DeMarco. In October of 1983, he filed for (and subsequently received) permission to convert the property from a lodging house into eight apartments. In March of 1984, he amended his plans to reduce the number of units to five. 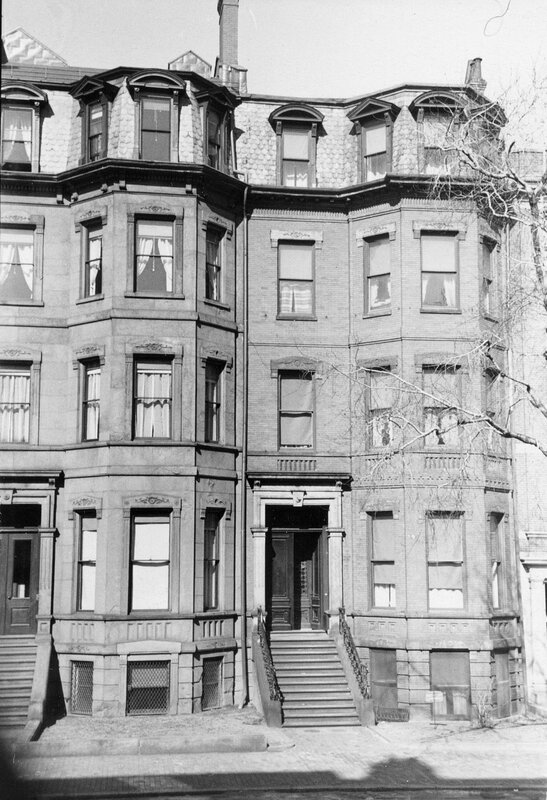 On July 27, 1984, Joseph DeMarco converted 109 Marlborough into five condominium units, the 109 Marlborough Street Condominium.